We all know that the pink ribbons, pink socks and gear worn on the sport’s fields, and even pink being added to hair that is seen each fall, are reminders of the victims and those still fighting the battle of breast cancer. Those pink ribbons, shirts and other items that are designed as a show of support for the families of breast cancer victims as well as a reminder to us to contribute towards finding a cure. At iSalon of Burlington, we take this fight seriously. However, rather than focusing on it just in October, we also have a special push every April to raise money for breast cancer research. As part of this fund raiser we sponsor a breast cancer survivor who participates in The Brave and Beautiful Pageant and other local events organized to raise awareness and research funding. New cases of breast cancer are diagnosed more than 252,000 times every year, or about 1 out of every 8 women. More daunting, is that just over 16% (40,610) will not make it. With numbers like these, iSalon of Burlington believes it is imperative that we get involved and do our part to help raise money for the research and treatment of breast cancer. In fact, in the spring of 2017, our salon raised the most money for the Alamance County region. 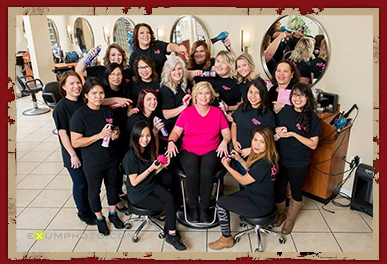 As part of our approach, we host special events such as a Cut-a-thon, selling raffle tickets or having a Ride for the Cure. Should you be interested in partnering with us in raising money for breast cancer research and awareness, please talk to Yvette or one of our stylists.